MrInka.org is an unofficial pricing / statistics tool for CS.Money. We are not responsible for any pricing errors. Make sure to read the "FAQ" and "How to use"! MrInka.org is a 3rd party tool to follow the item pricing on the CS.MONEY tradebot. We are in no way affiliated with Steam or CS.MONEY! We are offering a pricing database for every item that was listed on CS.MONEY in the last few months. 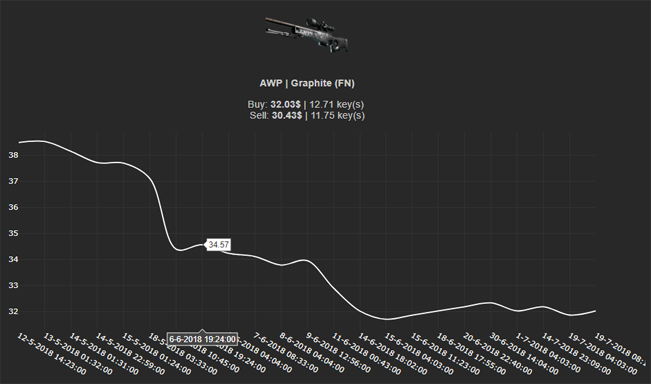 Additionally to the graph, we are predicting the "sell-price" for each item (with the name-bonus). What kind of key do you use for item prices in keys? It's the up-to-date average value for each different key type on CS.MONEY. It's being displayed on the top right corner whenever you perform a search. What does a red item text mean? We can not "predict" prices, we can only record items that are there. If the text is black, the items is either listed right now or has been there in the past 60 seconds. If the text is red, the provided price could be wrong. Hover over the item image to display the time since this price has been confirmed. Generally: Even tho our prices should be correct, we are not responsible for anything you might do with this information. For now: Yes! We are not that public or well known yet. Let's see what the future brings. So far, donations are always welcome!